In this article building of a simple thermometer for PC will be described. The unit is extremely simple and cheap to build. You will only need one NTC resistor, one diode and capacitor and serial port connector. 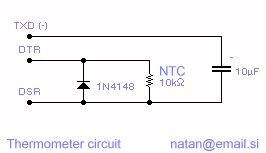 NTC thermistor is connected to other end of black-red wire. Let's say DTR and TXD are zero at the beginning. Nothing is going on. Then we set DTR to 1 and start counting time. 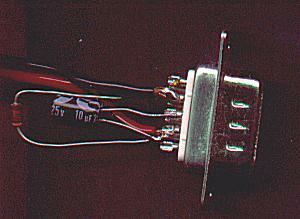 Capacitor is being charged through NTC resistor. 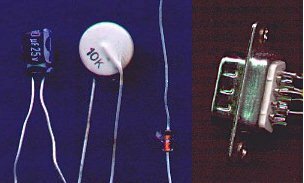 The higher the temperature, the lower the resistance and capacitor is charged more rapidly and vice versa. We use DSR pin to monitor the voltage of capacitor. When it is charged enough, DSR goes to 1, we stop counting time. 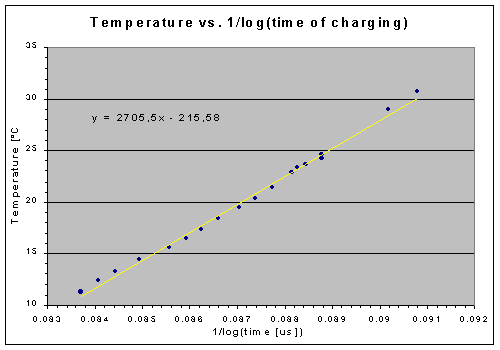 From elapsed time of charging we can calculate resistance of NTC, from resistance the temperature. After each measurement we set DTR to 0 to empty the capacitor through diode. The resistance of NTC thermistor can be approximated by exponential curve R (T) = R25 * exp(B*(1/T-1/298K)) (R resistance in ohms, R25 resistance at 25°C, B typical constant dependant on NTC value [unit is kelvin K]). Do not worry about those constants, we will not need them. You need another calibrated thermometer for calibration of newly built one. The best is good ole' mercury thermometer with 0-100°C range. Measure temperature and write down capacitor charging time (you can get this data in program). Change temperature and repeat process. Be patient! Thermometer need some time to reach external temperature. My way of doing it: I bound thermometer and NTC together and put them in plastic bag (to keep water away from thermometers). I put bag in glass with ice cubes. The ice melted, temperature of water began to rise because my room is hot (28°C). On every couple of degrees change, I wrote down temperature and time. When you have collected temperature vs. time data, enter them in fitting program. MS-Excel can do it. Plot temperature vs. 1/log(time). Fit with linear function. In my case, equation for temperature in Celsius degrees is 2722*1/Log(time in microseconds)-217. Therefore constants are A = 2722 and B = - 217. I wrote small Delphi application. For details, see source. First press "Calibrate" button to calibrate timing procedure. The frequency of your processor will be shown. Then select COM port and press "Open port". At the end you can finally press "Start". Do the calibration process as described above. When you enter correct factors also correct temperature will be displayed. Download zipped application with Delphi source: tempmeter.zip. Build it, hook it up, calibrate. Through the day temperature logging - You can throw it through the window and then log temperature vs. time. Write application that records temperature every 5 minutes and writes it to file (send me file with data and your location, I will publish it on web page). Model - Test if A*1/Log(time)+B is good way of fitting.. Chilling with wind - Pour watter in bottle, wait for temperature of water to be the same as air temperature. Wind humid cloth around bottle, put thermistor in it. Put whole stuff in shadow windy place (Chicago ;-). Measure temperature every minute. Think what happens and why. Created by Natan Osterman (natan@email.si) (c) 2000. If you want to use anything from this page for commercial purposes you have to get prior written permission from author. Non-commercial usage is free, but do not forget to mention original author. Educational use is also free and desirable. Knowledge and information should be free! Simple PC thermometer electronic circuit. PC related electronic circuits and schematics.